In March of 2012 we launched our 7" digital equivalent, the fortyFive series. The format required 2 tracks, each about 3 minutes in length. Tha Silent Partner was inspired by this format and wanted to push the envelope on what could be done within the approximately 6 minute time limitation. He came up with what would later become a series within a series… SIX ONNA 7. Six brief and tasty tracks that altogether ran no longer than 6 minutes. On July 12th, 2012, the series began with this initial release. TSP then continued to drop gems on what became the SO7 sub-series. Today he releases his latest installment, Part 3.5. 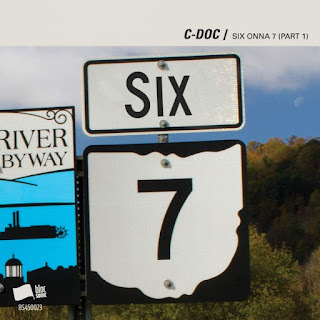 Thanks to TSP giving his blessing, today also sees the release of C-Doc’s first entry in the SO7 sub-series! However, C-Doc wanted to add his own subtle spin to it by distributing at as two tracks, one for each side. As with TSP’s SO7 releases, the brevity of the dope tracks makes for an adventerous listening experience. We hope you enjoy the format, a little birdy tells us another artist may just be joining the fun! Thanks once again to C-Doc for supplying those dope beats and helping to celebrate Netlabel Day with us! Thanks to Marcus J for dropping those ill rhymes! Thanks to TSP for inventing the SO7 format and allowing others to carry the torch!